Android is edging out iOS as the leading smartphone operating system in the consumer U.S. market, but Apple is still king of the mountain when it comes to share among smartphone manufacturers, according to the June numbers from market research firm Nielsen. While 39 percent of smartphones are running Google’s Android operating system, 28 percent of the market is on iOS. On the other hand, Apple’s control of iOS means that every iPhone sold counts towards Apple’s share of manufacturers, while Android phones are made by a variety of companies like HTC, Motorola, Samsung, and a bevy of others. 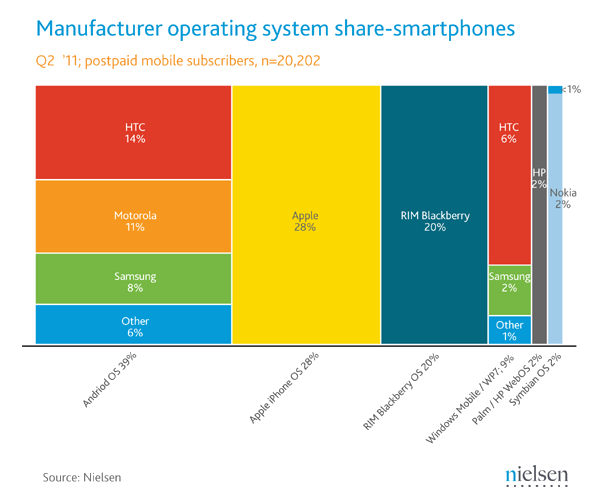 Among manufacturers, there’s a tie for second place between RIM, who owns 20 percent of the smartphone market with its BlackBerry platform, and HTC, who also has 20 percent of the market, divided up between Android and Windows Mobile models. Keep in mind that smartphone manufacturer market share is a different kettle of fish from operating system market share: Android numbers won’t include Android tablets, while iOS numbers won’t include the (much larger) population of iPad and iPod touch owners. And remember too that while a “latest and greatest” Android phone seems to surface every few weeks, Apple’s last update to the iPhone was in June 2010, and is available on just two domestic carriers. Earlier this month, the latest figures from market research firm ChangeWave showed a high demand for future iPhone purchases, while a survey from PriceGrabber.com said that 35 percent of consumers intended to buy the next model of Apple’s iPhone, sight unseen. So, even at a 11-point deficit, iOS clearly seems to be holding its own.